We are located in Atlanta, Georgia, USA. If you are looking for an English Cocker, we do have puppies available occasionally to approved homes. 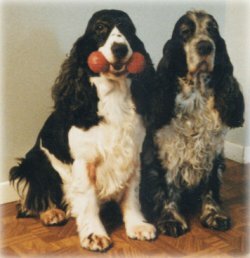 We provide health clearances on all our English Cockers, and will ship within the USA and Canada. You can surf our site by clicking on "next", or, if you are looking for one English Cocker in particular we have provided buttons directly to them. 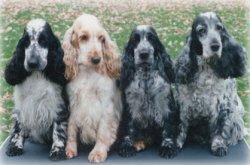 We also have links to full pedigrees on our dogs. Enjoy! who became the foundation for my line. *ECM stands for English Cocker of Merit. Advertisements on this page have been placed here by Tripod/Lycos. We do not endorse or support any of these vendors..